» Are Move Controllers Compatible With PlayStation 4? With the arrival of a new console, some elements from the last generation are bound to find themselves up on the chopping block as developers make way for new and better products. Sometimes these parts get integrated into the systems in better ways, other times they are simply left out never to be spoken of again. However, some elements get carried between generations, and the PlayStation Move controller for the PlayStation 3 is one such piece of hardware. The microphone-esque motion controller does work with the PlayStation 4. The PlayStation Move was released in 2010 and came in two parts: the motion controller and the navigation controller. There was also a charging dock that could be purchased as an extra feature. The original PlayStation 3 used the PlayStation Eye to track the movement but with PlayStation 4, the PlayStation Camera will be used instead. At the time of the original release, the PlayStation 3 had already been out for some time and Sony gave the Move its own sort of platform launch as they had intended for the hardware to revolutionize the way that their fans were playing games. It came out at a time when the Wii was popular with its full motion gaming and the Move was in many ways meant to counter that. The hardware sold very well shipping 15 million units by 2012, two years after its official release. It was praised by critics who were impressed with its technology and range. But the problem with hardware in this industry is that no matter how good something is, it doesn’t mean anything if the software doesn’t match it. Which is to say, no matter how incredible the Move’s hardware may have been, if it didn’t have the games, it didn’t matter. And that was ultimately the issue for the Move. Although it was critically acclaimed and even won the 2010 Popular Science award for its technology, it couldn’t quite get over the hump of not having the software to support it. There were very few Move exclusive games, and of those that were, they were mostly niche games rather than the AAA blockbusters that would have really forced fans to use the hardware. This led to the Move becoming more of a novelty and less of a revolution for gamers as Sony had hoped. Yet, the technology behind it is more than sound. Unfortunately, the company was not able to find the same sort of success that the Wii found with their motion controllers. Although, to be fair, it may have been a better trade off as Sony has found far more success with their actual systems than Nintendo did once the luster of the Wii eventually wore off. With the PlayStation 4, there is a chance that the Move will find a new life. The PlayStation Camera is an improvement over the Eye and perhaps with the combined force, developers will begin to throw more time into creating games that use the technology for what it was intended for, namely to enhance the gaming experience. Whether or not it actually gets a second chance on the PlayStation 4 by way of captivating software to support the Move is ultimately up to developers, as players have no reason to buy a Move right now. If developers begin to make worthwhile games in which the use of the Move controller is needed and not just a gimmick, then perhaps the hardware will see more use on the new system. It will also help to promote fans to purchase the PlayStation Camera which is not bundled with the system. To sum it all up: The PlayStation Move is indeed a strong piece of hardware, yet it was not given its fair chance in the market originally to really prove itself worthy of a purchase. Unlike many features from this winding-down-console-generation, the PlayStation Move is getting a new lease on life by being supported by the PS4, which could mean we finally get to see the Move as a fully realized piece of hardware rather than a niche, novelty afterthought as was the case on the PS3. What do you think readers? 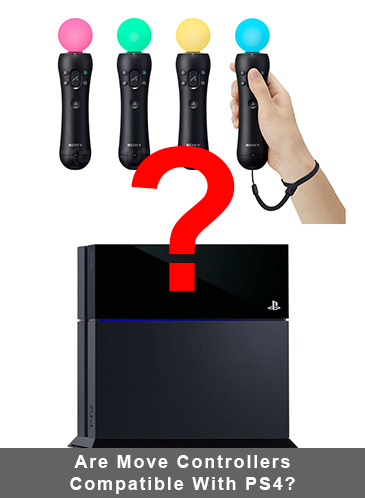 Will the PlayStation Move find a new life on the PlayStation 4 or will it flounder as it did on the PlayStation 3? I sure hope so. I love that thing !